The Highlands and Islands Medical Service was a unique social experiment in Britain long before the NHS. It was formally set up in 1913 with a Treasury grant of £42,000 in the wake of a report by Sir John Dewar’s committee. Medical and nursing services were either poor or non-existent in many areas within the crofting counties. Crofters did not qualify for services under the new National Insurance scheme. Doctors struggled to make any living in such sparsely-populated areas – apart from occasional summer visitors from the south on sporting holidays. War delayed the introduction of the service although a resident nurse was found for the island of St Kilda in 1914. Doctors had a basic income but could continue to treat private patients. Fees were set at minimal levels but inability to pay did not prevent people from getting treatment. State resources were directed to basic needs – providing a house, telephone, car or motor boat to get around and cover for further study and holidays. By 1929 there were 175 nurses and 160 doctors in 150 practices. Working in the most remote communities became an attractive career option for nurses and doctors. Not only was care being delivered to all sections of the community, it was of a standard higher than much of the rest of Britain. The American pioneer Mary Breckinridge visited Scotland in 1924 and on her return built the Frontier Nursing Service in Kentucky on the HIMS model. 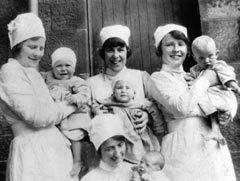 Services were extended to hospitals in the 1930s with further Treasury funding. Stornoway already had its first surgeon in 1924. Wick gained its first in 1931 with the support of Aberdeen University. Shetland and Orkney followed by 1934. Close links were developed with the other medical schools. By 1935 it was really taking off with the first air ambulance service. Eight patients were airlifted to specialist mainland hospitals under a contract with Scottish Airways Limited based at Renfrew. The first actual flight was in May 1933 for fisherman John McDermid in urgent need of an abdominal operation but much too ill for the sea and road journey. He was at the Western Infirmary in Glasgow just over an hour after the aircraft had left Islay. HIMS and local councils provided the funding for those who could not afford to pay and by 1948, the air ambulance service was carrying 275 patients a year. The Highlands and Islands Medical Service revolutionised care for more than 300,000 people on half the land mass of Scotland. Unlike other local medical schemes, it was directly funded by the state and administered centrally by the Scottish Office in Edinburgh working with local committees. By 1948 it had been providing comprehensive care for 35 years. The rest of Britain was about to experience it for the first time. Dr M Mackenzie, GP North Uist 1904.